Updated 24th May: Bill Kenwright is touring Rufus Norris' Cabaret with Will Young playing the Emcee before it moves into London's Savoy Theatre on 3rd October to fill the vacant slot left by the postponement of Bridget Jones the Musical. The booking period is until Saturday 19th January 2013. Young will be making his West End debut playing one of the most famous roles in musical theatre. According to the Mail Norris and Kenwright have been talking to Young for eight months about him doing the role. Kenwright said: "It’s one of those great, left-field casting ideas.It will change the trajectory of Will’s career. He’s not done the London stage before, but he has acted in film and television." The only dates I have so far is the Southampton Mayflower 3rd-8th September: Nottingham Theatre Royal 10th-15th September: Norwich Theatre Royal 17th-22nd September and The Lowry in SalfordQuays from 24th-29th September prior to the West End opening on 3rd October. 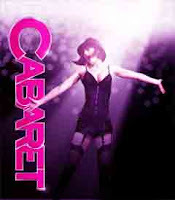 Since its Broadway premiere in 1966 and the famous movie version with Liza Minnelli and Joel Grey, Cabaret has won 8 Oscars, 7 BAFTAs and 13 Tony Awards. This Double Olivier Award Winner and Variety Club Awards "Best Musical", turns 1931 Berlin into a sizzling haven of decadence, and at its heart is the legendary Sally Bowles, who performs nightly at the infamous Kit Kat Klub. Cabaret features show-stopping choreography and some of the most iconic songs in musical theatre including Money Makes The World Go Around, Mein Herr, Maybe This Time and Cabaret. I hope the tour is not as diluted as the previous tour became. On its last outing, the west end production was excellent however when it closed in the west end then toured, the production became so watered down that the KitKat Klub which was and should be a den of iniquity, was more akin to a Joe Lyons corner cafe....I look forward to seeing this production.